The 2018 FIM Motocross World Championship launched with a fanfare on the skills and longevity of Red Bull KTM’s Antonio Cairoli, but also with eager questions as to who could possibly overthrow the Peter Pan-like Sicilian, the majority of focus falling on teammate Jeffrey Herlings and the prospect of the first inter-team title dispute in the premier class for a number of decades. What happened in the picturesque depths of Argentina? Read on for the five main talking points from the first Grand Prix of 19. Amazing stuff. Even now, several hours after the race and in the depths of the bright Neuquen press room, it is still hard to deduce much into the first episode of sparring between the 32-year-old nine-time world champion and defending number one and the 23-year-old three-time MX2 title winner and owner of 68 Grand Prix wins. Cairoli brought some unbeatable pre-season form to the wide, fast, and deceptively slick volcanic terrain and cleared-off with qualification and both holeshots. Herlings travelled to Argentina on the back of a virus—but also his clearest and hassle/injury-free winter for a number of years— and the sheer strength of the Dutchman was evident as he worked through the top five of the pack on both occasions (mostly disputes between Monster Energy Kawasaki’s Clement Desalle, who was third overall, and Monster Energy Yamaha duo Jeremy Van Horebeek and Romain Febvre). Cairoli seemed to have the measure of his teammate and much-hyped closest threat to a possible Everts record-equalling ten title total. Herlings ploughed a course to the rear of the other 450SX-F (a pre-production 2019 machine and with some prototype tweaks, mainly to the chassis) and was just a second away from the win in the first moto. The exciting climax boded well for the second outing, but Cairoli again escaped and had an advantage of nine seconds over Herlings with nine minutes left of the 30-minute and two laps on the clock. He was asked later about how he managed to shrink this gap and mug the champion on the last lap (with his fastest effort of the whole affair) for his seventh victory in MXGP. AC explained that a series of small mistakes when trying to change lines to evade the closing Herlings had a catastrophic effect, and the win bonus slipped through his fingers. In summary? Forty-seven points each, one win each, Cairoli with acumen from the starts, Herlings with the power to retaliate in customary style. If the dynamic continues this way, then one rider is bound to falter in some aspect—who will break gaze first? For those wondering about any sensationalism, there was warm recognition and respect between the riders… but there are hundreds of race miles and intense mileage left in this one yet. Neuquen sits on the Argentina border with Chile and in the impossibly scenic depths of Patagonia. It was the fourth time that the inviting and quick circuit was staging MXGP, and the first as an opener for the series. Most of the European teams were relieved to escape the icy grip of Storm Emma that had thrown a thick blanket of cold, ice, and snow over large patches of the continent. The paddock is accustomed to kickstarting the season in pleasant conditions after five years launching the Grand Prix term in Qatar. As usual, the meeting counted on the passionate following of the native fans, and the local town of Villa La Angostura was a thriving hub of activity across the weekend; the high street of bars and restaurants was almost audible with bench racing hubbub when passing through in the evenings. Having former Grand Prix winner (and nearly retired) Rui Gonçalves as full-time liaison between Youthstream and the riders paid early dividends on Saturday night when the large waves section was proving too sketchy and problematic. Red Bull KTM’s Jorge Prado was lucky to escape injury after a fast get-off in qualification there on Saturday. 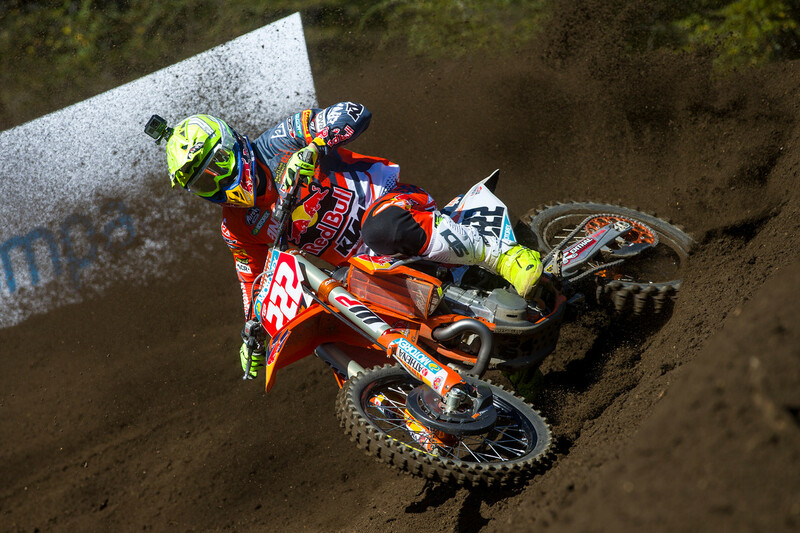 Teammate Glenn Coldenhoff was a heavy faller in the MXGP outing the same day. The zone was lowered and eased for Sunday. The track increased in technical demands during the racing, but was still wide-open and enticing for a heavy throttle hand. Leaders Herlings and Cairoli admitted to being surprised and slightly awed by their speed and the yawning 30- and 23-second chasms to Desalle in third spot. Will MXGP return? Despite the Indonesian double-header in July, the South American trip is easily the longest and most arduous for the teams and riders. The consensus is that Neuquen is worth the trek. Both Youthstream and the local promoter were non-committal on 2019 amid rumors that the championship could move closer to Buenos Aires or to the city of Cordoba, where the 2018 Dakar Rally ended. 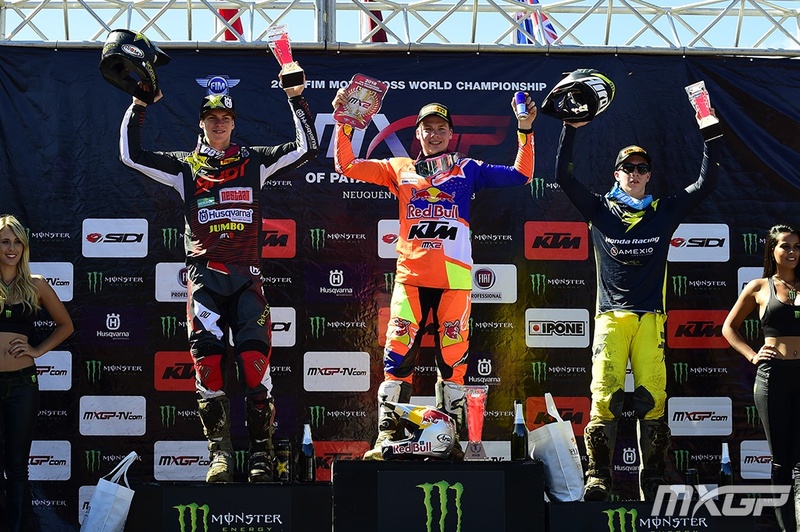 David Eli, speaking as the power behind the Grand Prix in Argentina, decreed that the future of Neuquen depended on attendance, and the turnout looked healthy for the weekend—the Argentines are normally thirsty for their motocross. He also said a decision would not be made until July. The MX2 class has just four riders with Grand Prix-winning experience for 2018—and a host of raw talent itching for milestones and podium glory. Twelve months ago, Red Bull KTM’s Pauls Jonass was one of those maiden victors at Qatar and was closely chased by Benoit Paturel. A year on and the world champion had no such peer in Argentina. Jonass ruled every single session for a clean sweep, although the Latvian missed out on the holeshots. “At least I still have something I know I can improve on,” he semi-joked. Jonass’ easy push to the front in both motos was marginally troubled by 114 Motorsports’ Hunter Lawrence. The Australian took over the lead of the first race from Bike It DRT Kawasaki’s Darian Sanayei after a fuel line problem ended his rapid speed. Jonass diligently worked his way up to the back of the GEICO Honda-bound talent and made the most of a few slips by the Honda man to take control; the power and pick-up by the works 250 SX-F evidently superior to the new CRF250R. Jonass simply disappeared in the second moto as Rockstar Husqvarna’s Thomas Kjer Olsen—the rider most likely to topple the champion’s steely start to the year—was a deserved and clear second. While the extent of the challenge to prevent Jonass from being KTM’s third back-to-back champion in MX2 since 2009 is still unclear, MX2 did throw up some other promising sights. Kemea Yamaha’s Ben Watson rode superbly for a personal best classification of fourth overall on his YZ250F debut and first event as a factory rider. Watson was also racing against the ghosts of 2016 at Neuquen (then hosting round four), where the young Brit landed and cracked his foot to such an extent that he missed the rest of his rookie season. HRC’s Calvin Vlaanderen was a roaming presence behind Lawrence in the second moto, and Sanayei’s third spot in the same dash was another “PB” and the first top three ranking for the American in what is his second Grand Prix campaign. 4. Is Lawrence the real deal? There were some factors going against the Australian with his GEICO technical support and for what was the first race with Honda and for former Women’s World Champion Livia Lancelot at the helm of her new team. There was a lot to take on board for the 18-year-old, who scooped two podium finishes in the last three rounds of the 2017 championship and also aced the Ricky Carmichael Award at the Matterley Basin Motocross of Nations. As well as some mysterious personal issues that he hinted at, Lawrence repeatedly stated that Neuquen was not one of his favorite tracks and he rarely felt “on fire” across the weekend. The GEICO tag and new Monster Energy deal has helped raise his profile, and the Aussie has a high standing among his peers for good reason. Watching #96 and his technical ability is abundantly clear. More than perhaps any other athlete, he was able to measure and guide the CRF exactly where he wanted on the bumps and ripples; it was a pleasure to watch how exact and smooth he could be. Hunter commented that the move to the USA will come around fast and he is under no illusion that he has precious little time to deepen his footprint on Grand Prix. Stunts like wearing an Argentina football shirt with his name and number on the back (gifted by a fan) for the sighting lap on Saturday was a good example of how his fan base could rapidly expand as much for his character as well as his skills. He needs to work out how to catch Jonass, to find something extra from that unsupported Honda (will HRC also help out as the season progresses? ), and keep watch on riders like Olsen, who is fitter and leaner compared to his rookie year in 2017 and is a sleeping lion on the Husky. On the subject of MX2 talent, a special mention to the showings by Wilvo Yamaha’s Jeremy Seewer and Monster Energy Kawasaki’s Julien Lieber on their debuts in the MXGP class. Both showed top ten mettle. Lieber racing for the first time since damaging his knee at the tail end of 2017 and Seewer, last year’s championship runner-up, after a protracted deal fallout from Suzuki to Yamaha. Lieber going 8-12 pleased his Kawasaki crew while Seewer was a decent seventh in the first moto, but the power and ferocity of the 450s flared up in the second sprint as the Swiss was ejected from another lofty berth in the standings, fortunately without injury. 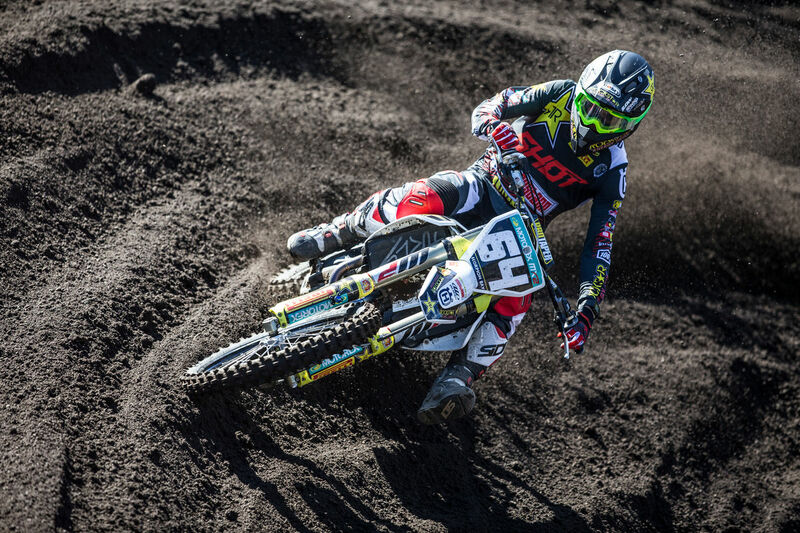 Rockstar Energy Husqvarna’s Thomas Covington knew Argentina would be a fiery baptism to the season and his third year with Jacky Martens’ crew. Left ACL surgery as a consequence of a knee twist at the Motocross of Nations left him on the back foot in terms of prep. He went 10-18 and ran briefly near in the front in the second moto. On the other side of the paddock, Sanayei’s speed—at the venue where he scored his best results in 2017—was undoubted. Less was known about the potential of his brand-new Steve Dixon-engineered KX250F. Dixon’s ideas and engineering mean that the crew’s MX2 bike is a true prototype with some interesting innovations, including a carbon air in-take and airbox and multiple revisions to save valuable weight. Sanayei had not competed or used the machine in pre-season. It was a busy weekend for the mechanics and the engine let go with a fuel line failure in the first moto as the American leapt out of the gate and set the pace. The bike and rider showed their potential with that top-three run in the second race. Despite the on-track fluctuations of fortune, there were some other adventures. A shout as well to the new gear worn by Sanayei and Searle. ASW are a large Brazilian brand that fabricate in their own facility and are dipping their toe into MXGP for the first time. The livery, design, and quality of the racewear was another small eye-catching element of what was an intriguing first Grand Prix. Next up is the shallow sand of the Eurocircuit in Holland for the European round in two weeks.